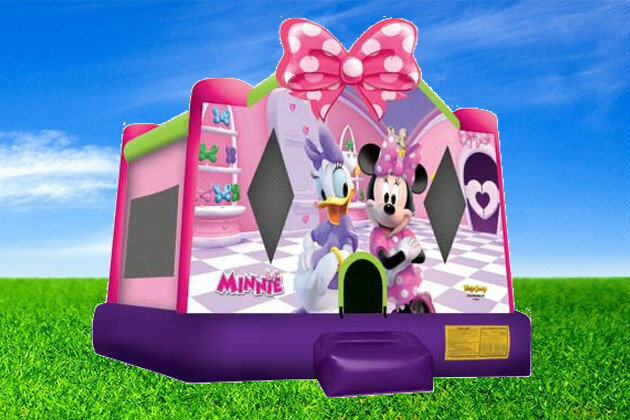 Minnie Mouse Bounce House Rentals | BounceGeeks.com Richmond, VA.
Minnie Mouse and Daisy Duck are here for the party! Look at that beautiful big bow on top of Minnie's bounce house! Daisy Duck and Minnie Mouse welcome your kids for all the bouncing fun! This awesome large size bouncer will be the highlight of the party and really make it a special day for your little one. Everyone will stay safe as the parents can easily see inside through the safety netting, and also features inflated entry/exit step. We set this up for a birthday party in Richmond, VA and the kids were so happy when they saw it.